A suite of environmental installations designed for GE Tax and Energy Financial Services occupies prominent locations throughout the new headquarters building. The new facility is a multipurpose meeting center used by all GE divisions.A twin pair of circular media displays face each other across the main lobby. In one, the corporate logo slowly cycles through a low-wattage, LED-driven branded color spectrum. 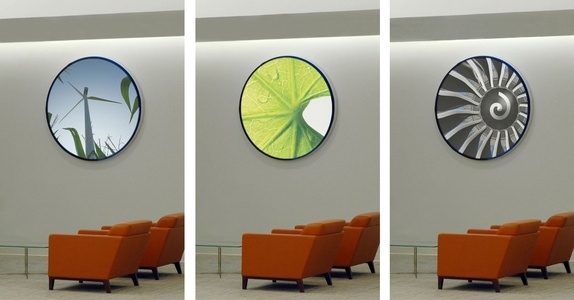 In the other, an ambient motion graphic of circular imagery of sustainable GE products unfolds at the same speed. The “GE Skyline” is a 40-foot-long custom illustration by artist Stephen Alcorn that assembles iconic GE buildings like Nela Park and 30 Rockefeller Center into a single imaginary city. 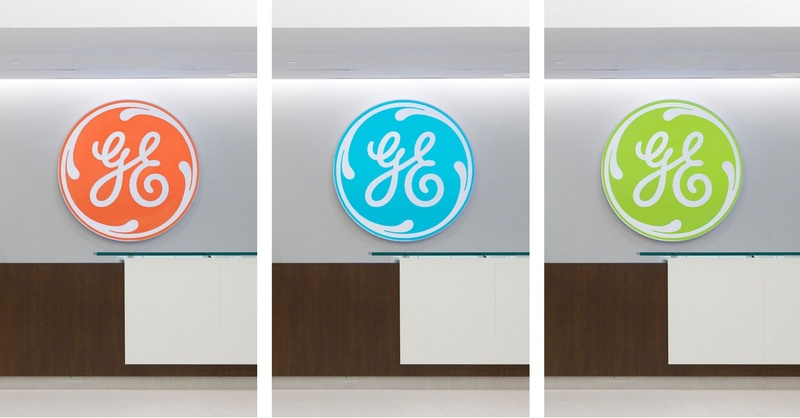 The “Innovations Corridor” highlights GE’s most innovative products and services using hues from GE’s brand color palette. The hanging murals here are printed directly on natural fiber canvas, and large letterforms are done in sustainably harvested plywood.